​Our history--28 years--and it seems just like yesterday. ​​My name is Allan Goldstein and I am the owner of Aerial Images Photography. Way back in the last century, I graduated from Northeastern Illinois University in Chicago with a B.A in Mathematics. I also earned my private pilots license in the early 1970's, flew for a few years and met my wife Terry, Eventually. I quit flying as starting our family became our priority. Fast forward to 1986. 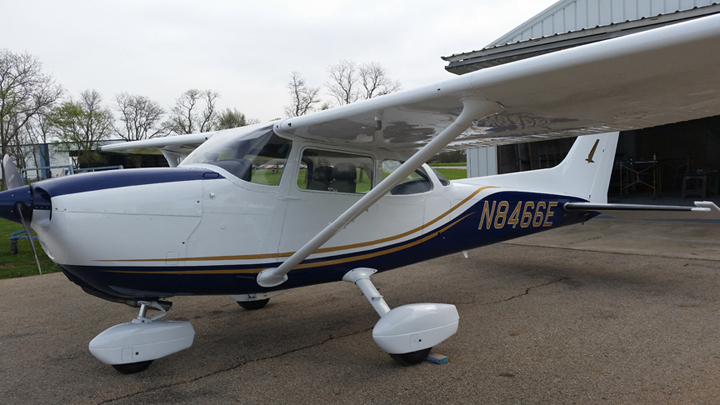 I was coerced into an airplane ride..and darn..I was hooked again, but now my goal was to earn my instrument rating, commercial license and 3 Certified Flight Instructor ratings. Eventually, I also earned my multi-engine rating and became rated as second-in-command in a corporate jet. In 1989, just as a lark, I shot some photos of my employers company picnic where all the people would line up to create the company letters "CTG". Surprise of surprises...my first attempt at aerial photography was a success! The company even published the photos in their corporate newsletter. After some research as to who would use aerial photography, we decided we'd found a niche. It wasn't until 1989, we purchased our airplane, a Cessna Skyhawk pictured on the right, that we also used for flight instruction. We still have the airplane hangared at DuPage County Airport in West Chicago, IL. Our first camera was the Pentax 6x7 with a negative size of 6cm x 7cm --certainly a professional piece of equipment, back in those film days. We eventually learned how to develop photographs and converted a spare bathroom into a darkroom for printing client photographs. It wasn't until February, 2007, we made the switch to digital photography, learned Photoshop and began producing prints with ink-jet printers. Today, we have a very sophisticated set of Canon top-of-the-line professional digital cameras and lens and a very strong knowledge of color management, Photoshop and graphic design which we use for our oblique and vertical airplane photography. We are now also offering drones photography and have filed the legal paperwork to allow us to use the drone for commercial purposes. ​We are also dog lovers, having raised 5 rescue beagles. 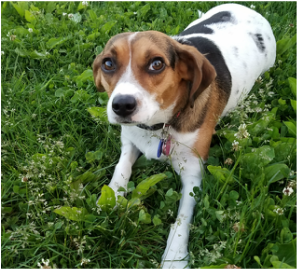 This is "Lexi", our sweet beagle/rat-terrior female, also a rescue.